Like every organisation, we hold an Annual General Meeting to conduct business including electing board members, making important decisions, and informing members of past and future events. 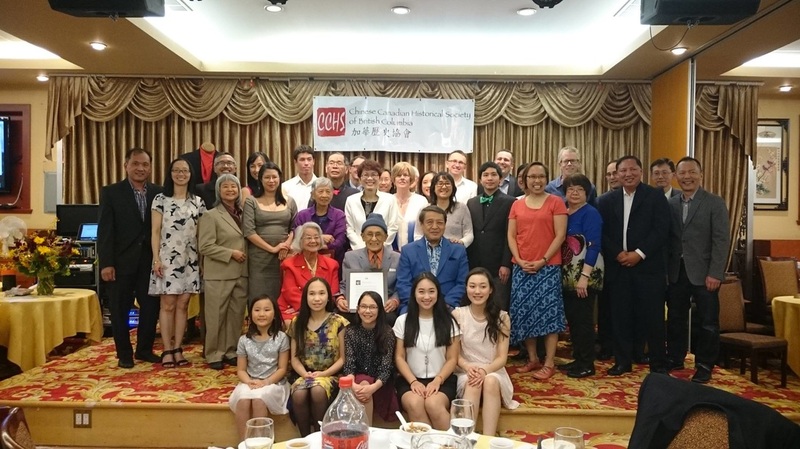 In addition, each year, we honour individuals and/or organisations for their contribution to Chinese-Canadian history. Brandy Lien-Worrall is a writer, editor, book designer, and community arts event organiser. In 2008, she was enrolled in the MFA Creative Writing programme at the University of British Columbia, and was the associate editor of the Amerasia Journal - the premier journal for Asian American Studies published by UCLA. ​Brandy was instrumental in the highly successful launches of three books of family stories resulting from the CCHSBC Writing Workshops in which she facilitated. 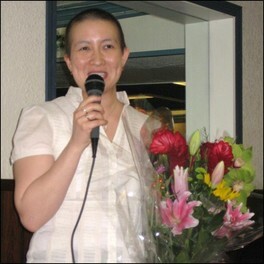 She was also the editor of all three books - ​Finding Memories, Tracing Routes: Chinese Canadian Family Stories (2006), English & Bilingual Editions; and​ Eating Stories: a Chinese Canadian and Aboriginal Potluck (2007). Dr. Wallace Chung was born in Victoria, BC, attended both UBC & McGill University, and was amongst the early Chinese Canadians to embark on a professional medical career. Wally specialised in vascular surgery throughout his forty year career, retiring from UBC as Professor of Surgery and UBC Hospital's Head of the Department of Surgery in 1991. ​Dr. Madeline Chung was born in Shanghai, China, and grew up in Hong Kong. She came to North American in 1949, specializing in obstetrics and gynecology. Like Wally, she had a forty plus year career in Vancouver where she delivered over 6500 babies. In 1999, she was made an honourary Life Member of the British Columbia College of Physicians and Surgeons. ​Both Wally and Madeline are active members of their community. Wally contributed his time generously to various organisations including the Canadian Multiculturalism Council, British Columbia Heritage Trust, the Vancouver Chinese Cultural Centre and the Vancouver Maritime Museum. He was awarded the Order of Canada in 2005. 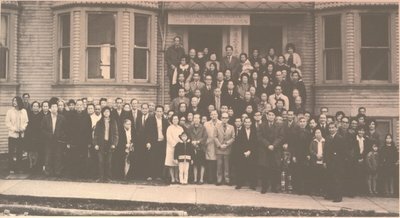 Madeline was a founding member of the True Light Chinese School in Vancouver. In addition, they generously donated the Chung Collection to UBC which includes many rare and unique items: documents, books, maps, posters, paintings, photographs, silver, glass, ceramic ware and other artifacts in Chinese Canadian history. The Chung Collection is one of the most exceptional and extensive collections of its kind in North America. It is both a personal collection and a national treasure. Larry is a Founding Director and Past President of CCHSBC. He grew up in Chinatown with a tailor father who emigrated from China in 1911. Larry has a lengthy history of community service and membership in many organisations. He has been a director, as well as, curator and historian for the Chinese Canadian Military Museum. He produced a veteran's oral history project funding by ​Canadian Heritage​. In addition, Larry is also CCHSBC's local history, host of "Ask Larry". He is the co-author to Eating Stories: A Chinese Canadian and Aboriginal Potluck, and the author of Dim Sum Stories: A Chinatown Childhood. Jan is a founding board member of CCHSBC, a board member of numerous community, service and cultural organisations, an internationally recognised scholar, and a super friendly person who exudes energy and engagement of many things Chinese and Chinese-Canadian. He has been a professor of Chinese and Asian Studies at UBC, the University of Victoria, and at Simon Fraser University. He founded and directed the Centre for Pacific and Oriental Studies at UVic. In addition to teaching, he served as the First Secretary for Cultural and Scientific Affairs at the Canadian Embassy in Beijing (1981-1983), and was the Senior Vice President of the newly established Asia Pacific Foundation of Canada (1985-1987), where he founded and developed the first Education and Cultural Affairs programmes. He is the founding director of the David Lam Centre for International Communications and the Asia-Canada Programme at Simon Fraser University. Joe chose to dedicate his professional life to socially responsible community initiatives and was particularly passionate about the preservation and revitalisation of Vancouver's Chinatown and the adjacent Strathcona neighbourhood. He was a leader in the fight to stop the freeway through Gastown, Chinatown and Strathcona, and upon winning that fight, was instrumental in securing the former freeway interchange site for the Chinese Cultural Centre and the Dr. Sun Yat-Sen Classical Chinese Garden. ​As an architect for significant Chinatown projects, Joe consistently demonstrated cultural sensitivity and respect for history as evidenced in his various projects. In the fall of 2016, Joe was nominated and awarded the Architectural Institute of British Columbia's Lifetime Achievement Award. His iconic architectural designs shaped Vancouver's Chinatown and Strathcona neighbourhoods, as did his activism. "He cared about the issues, but he also cared about the people who came together to argue, and cajole, and sometimes shout at each other about what was best for their community," said Dr. Henry Yu. ​In January 2017, Joe suffered an aneurysm and left behind an undeniable legacy of activism and generosity. He is survived by his wife Lynn and his son Jonathan. For four decades, Fred Mah has been one of Chinatown's strongest advocates playing a role in countless community associations and civic committees. Fred served as an active member of numerous community organisations and trade delegations. 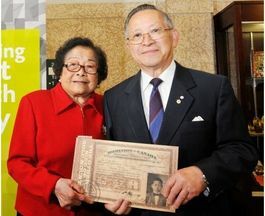 He was a founding member of the Vancouver-Guangzhou Friendship Society and the BC-Guangdong Business Council, serving as president for both organisations. He organised countless Chinatown parades, art exhibits, photo and opera exchanges. 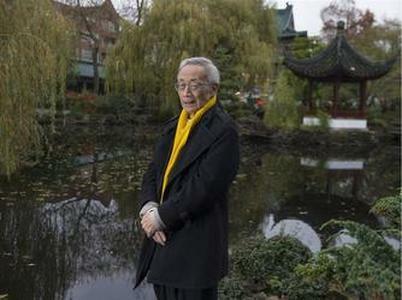 ​Fred was a founding member of the Vancouver Chinese Cultural Centre, and CCHSBC. He chaired the Chinatown Visioning Committee for Chinatown Revitalisation, and founded the Friends of False Creek and the Chinatown Society Heritage Building Association. Elder Larry Grant is of mixed Chinese and Musqueam ancestry. He was raised in Musqueam traditional territory and attended Vancouver Technical Secondary School. After retiring as a longshoreman, he enrolled in the First Nations Language Program at UBC to reconnect with his mother's ancestral language - hәn̓q̓әmin̓әm̓. Today, he is the Elder-in-Residence and adjunct professor at UBC's First Nations House of learning where he welcomes visitors, students, and staff from around the world. ​Howard Grant is Larry's brother, also born and raised in Musqueam traditional territory. Howard is a knowledge keeper in the Musqueam community. He has been a Councillor on Musqueam Band Council for the past 14 terms, and he has 30 years of combined experience working in First Nations and federal governments. In 2014, he as the Executive Director at the First Nations Summit. ​In the Fall of 2013, Larry and Howard, along with other family members returned to their father's ancestral village, Sek Kei, in the Zhongshan County, Guangdong Province. Their journey was documented in the Award Winning documentary - ​All Our Father's Relations​. 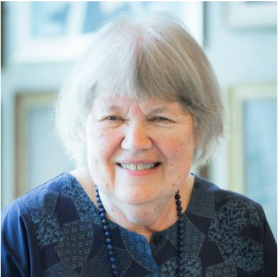 Jean Barman is a CCHSBC Founding Director, Professor Emeritus, Author and Historian of British Columbia. She received the 2014 George Woodcock Lifetime Achievement Award recognising her long career in bringing the province's history to life. This annual award honours a BC author whose outstanding literary career and contributions to society span several decades and Jean's name is added to the Writers Walk of Fame on the north plaza of Library Square in Vancouver. BC, Canada, women, Chinese Canadians and indigenous peoples. A recipient of the City of Vancouver's Book Award in 2006 for Stanley Park's Secret​, Jean was also awarded the Lieutenant Governor's Medal for Historical Writing in 2004 for ​Sojourning Sisters. ​Jean has been active with the BC Heritage Trust and other historical organisations. She was inducted as a Fellow of the Royal Society of Canada in 2002 and was a recipient of the Queen Elizabeth II Diamond Jubilee Medal in 2012 as well as many more literary and recognition awards. The Wong Family with Minister Teresa Wat at the 2016 AGM Gala Dinner. Modernize Tailors has been outfitting Vancouverites for over 100 years. It is now the oldest existing family-owned business in Chinatown. ​Wong Kung Lai arrived in Vancouver in 1911 and started work as a house boy on the west side of the city. He soon was able to step into an apprenticeship with a tailor from England. Two years later, after learning the trade, he set up his own shop. ​With his future prospects secure, Wong Kung Lai headed to China in 1920 to marry Chun Man Ming. The couple returned to Vancouver in 1921 and settled into life in the city with their nine children. Modernize Tailors was one of many tailor shops in Chinatown. Despite the competition, the firm thrived. In its heyday, the shop was a sever-day-a-week operation with 20 employees. ​Sons, Jack and Bill, received their engineering degrees from UBC, but with no real employment opportunities the brothers started working in the tailor shop. They eventually took over the shop with Jack handling the layout and cutting, and Bill taking on the ironing and pressing. Jack passed away in 2013 but the firm continues today with Bill continuing to come to work each day. ​Modernize Tailors' suits were made for people from all walks of life and were a rite of passage for many. Vancouver writer and historian Larry Wong fondly remembers his visit to the shop for his graduation suit in 1957. Over the years, they have outfitted legions of stylish Vancouverites including many of Hollywood's stars in town on film projects. ​Generations of Wong family members have become outstanding leaders in business, community, and philanthropy with significant contributions to the social and cultural life of BC. ​SPOTA was formed in 1968 by area residents to stop Vancouver City Hall's final phase of urban renewal bulldozing of their community and replacing it with large public housing complexes and a freeway thoroughfare. The organisation was successful in negotiating a tri-level government agreement for a comprehensive neighbourhood improvement programme, the Strathcona Rehabilitation Project (1971-74), the first of its kind in Canada. In 1973, the Canadian federal government introduced national neighbourhood improvement programmes based on the Strathcona experience. For SPOTA, neighbourhood rehabilitation also included providing affordable family housing to restore the community fabric. Between 1974 and 1980, the community organisation built over 170 units of affordable, co-operative and seniors housing to restore a stronger residential base. “We are proud to acknowledge and celebrate SPOTA’s vision and successful fight to save the neighbourhood, pilot Canada’s first neighbourhood improvement program, and build affordable family housing” said CCHSBC President John Atkin. “SPOTA’s legacy goes much beyond Strathcona and Vancouver. The organization changed national urban policies and entrenched citizen participation” as a requirement in urban planning". Over his fifty-year career in law, Justice Randall Wong achieved a number of incredible firsts: the first in his family to attend university, the first Chinese Canadian provincial Crown Counsel (1967), and the first Chinese Canadian federally appointed judge (1981). "Back in those days there was no training to prepare you to be a judge. ... I remembered some of the judges that I most admired, and I basically tried to emulate them." When he retired on April 14th, 2016, his birthday, a special sitting was held in his honour. At this point, he was the longest serving judge in BC, appointed to the Supreme Courts of British Columbia, the Yukon and the Northwest Territories, and Nunavut's Court of Justice. Practicing at a time when Chinese Canadians rarely studied law due to earlier prohibitions, Justice Wong is truly a pioneer of Canadian law. Retired Colonel Howe Lee is a third-generation Chinese Canadian born in Armstrong, BC. Howe is well known for his very distinguished military career of 35 years, which included command positions as the CO of 156 Company, RCASC, the 2I/C of The Royal Westminster Regiment, the CO of the 12th Service Battalion, and numerous staff positions with Brigade. He concluded his military service with an appointment as Honourary Colonel of the 39 Service Battalion. At a community level, Howe has excelled in his leadership with numerous national, provincial, and municipal organisations, both military and civilian. Howe is the founder and first President of the Chinese Canadian Military Museum, which tells the history of Chinese Canadian Veterans in both the First and Second World Wars. In addition, Howe helps with the coordination of cadet programs, promotes Veterans' Week and Remembrance Day in public schools, and plans and participates in local Remembrance Day ceremonies. In May of 2016, Howe was awarded the Meritorious Service Medal (Civil Division) in recognition of his "outstanding accomplishments that set an example for others to follow and bring benefit to our country". In addition to his work with the CCMM, Howe is also a founding board member for CCHSBC, and while he stepped down from the board, Howe continues to conduct our election of board members annually.